A crucial point here is evolution. The environmental battle, spearheaded by the Southern Ocean Whale Defence campaign, had become more troublingly sophisticated. “Military” tactics, claimed founder Captain Paul Watson, were being used by Japan. An already slippery adversary had raised the bar. But Watson, in his announcement, was attempting to give some lustre to the long-term efforts of the project. Against absurdly gargantuan odds, a small organisation’s resources were mustered to save whale species from imminent extinction. “In 2005 we set out to tackle the world’s largest and most destructive whaling fleet.” It was a destruction centred on targeting 1,035 whales, including an annual quota of 50 endangered Fin whales and 50 endangered Humpbacks. The sceptics were to be found on all sides: they doomed the organisation’s mission to imminent, crestfallen failure. For Watson and his dedicated piratical crew, the law of environmental protection often lagged, while political action and matters of enforcement proved timid. States with greater power and resources were simply not keen on ruffling Japanese feathers. Statements if disapproval hardly counted. Japanese whalers have faced the legal music in a range of venues, though as with everything, the might of the gavel doesn’t necessary restrain the might of a state, whether directly used or incidentally employed. In November 2015, Kyodo Senpaku Kaisha was fined $1 million by the Australian Federal Court for hunting minke whales within an Australian sanctuary as defined by Australian environmental law. The whaling company cared not to turn up nor subsequently cough up. For years, the militant nature of the organisation brought various agents, and agencies, into play. It used guerrilla tactics of gumption and daring, though it was the sort of audaciousness that divided opinion, even in the environmental ranks. Such methods may well been crude but few could dispute their effects. In 2012/3, Japanese whalers, according to Watson, returned with a meagre 10 per cent of intended kills. The strategy of the Japanese whaling fleet, as Watson reflects, has always been shape shifting, apologetics followed by bellicosity; the fictional narrative of science overlaying arguments of culture. While still flouting legality, the number of intended whales has fallen to 333, a victory that can be, to a degree, chalked up to Sea Shepherd’s techniques of mass irritation and disruption. But to this can be added a more expansive scope embraced by their adversary: wider killing grounds, more opportunities to gather their quarry. Sea Shepherd’s mission remains, as outlined on its web site, “to end the destruction of habitat and slaughter of wildlife in the world’s oceans in order to conserve and protect ecosystems and species.” But more than a few in the Japanese whaling fleet will be pleased at the organisation’s absence this killing season. Dr Binoy Kampmark is a senior lecturer in the School of Global, Urban and Social Studies, RMIT University. He was a Commonwealth Scholar at Selwyn College, University of Cambridge. He is a contributing editor to CounterPunch and can be followed on Twitter at @bkampmark. Back in 2014 The International Court of Justice’s 16-judge panel ruled 12 votes to four in favour of Australia’s argument that Japan’s whaling program was not in fact designed and carried out for scientific purposes. The court ruled that Japan must revoke current whaling permits and refrain from issuing any more. The ICJ’s ruling is final and there will be no appeal. ‘A spokesman for the Japanese government said the court’s decision was “deeply disappointing”. “We are deeply disappointed and regret that the court ruled that Japan’s research whaling program in the Antarctic did not fall within the special permit clause of the treaty,” spokesman Nori Shikata told ABC NewsRadio. “However Japan will abide by the judgement of the court that places a great importance on the international legal order and the rule of law. ABC NewsRadio’s Marius Benson speaks to Japan’s spokesman, Nori Shikata, about his government’s view on the court decision. “We will abide by the decision of the courts and although we will consider a concrete future course of action very carefully, upon studying what is stated in the judgement, we will cease the current research whaling program in the Antarctic pursuant to the judgement. Maybe the Sea Shepherd needs military technology too. Drones come to mind. Well done the Sea Shepherd team. I second the idea of drones – a lot of very annoying drones. I am quite sceptical of Paul Watson and Sea Shepherd, but that’s not to say those involved are not good people. However, when the focus is upon Japan mostly, versus northern European whaling nations getting less focus, while decades ago Paul Watson was hanging out with Paul Ehrlich (ZPG Zero Population Growth & Club of Rome) and John Tanton (ZPG, CIS etc. networking anti-immigration and white nativist organisations now supporting Trump and has been linked to Sustainable Australia). After watching Sea Shepherd’s own documentary featuring Paul Watson, that sceptical feeling became outright cynicism; it’s seems more about a cult of personality with a strong dislike for humanity masked by a love of whales. Thank you, Terry2, for reprinting this judgement and the Japanese response to it. So, it appears that for the sake of “we’ve always done that”, no change can be contemplated. And no judgement is worth the paper it is printed on unless in can be enforced. Numerous AUS governments have sidestepped the issue despite some blustering (Rudd?). Now, if we look around us and notice the level of ever increasing environmental destruction, perpetrated under the same old furphy arguments as “we need the jobs”, “there is money to be made”, “there’ll be a bright future”, surely the time must have come to ask ourselves: WHEN IS IT ENOUGH ? Surely, even the most bone-headed individual must realise that this slaughter on the environment, and the whales are but one part of it, must lead to the ultimate disappearance of mankind. There are many humans who prefer animals to other humans – for good reason. Doesn’t mean they are trying to destroy the human race – in fact it is those ‘humans’ who make the most noise about their perceived love for humanity I hold in deep suspicion. I do not necessarily condone all of Watson’s methods, but when compared to the methods of whale-hunters, I know where my support remains. I understand people’s sentiments and supposed environmental logic of focusing upon whales (without JD Rockefeller and Standard Oil they would have become extinct long ago), but one should be aware of all species and be aware of astroturfing of supposed environmental issues, to mask old ideas of class and society. If I implied a binary us V animals, it was not my intention. I just feel for any who do not have a voice. This includes anyone from refugees to whales. 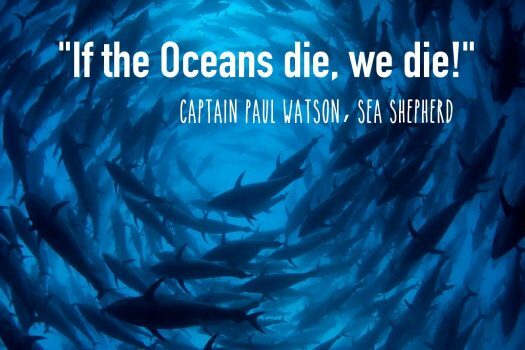 I applaud the Sea Shepherd’s efforts and all those involved in trying to stop the seemingly endless destruction of anything living on this planet ( apart from humans). The efforts of organisations such as Sea Shepherd has created enormous awareness of the senseless killing of many sentient beings and with the rise of social media and the immediate dissemination of information, there is hope for the future of this planet. That is, if there is anything left to save. The battle to save humanity depends on us winning the battle to save the environment and that battlefield has many fronts. “In the ‘throwaway societies’ of the industrialised world, this is an increasingly common scenario: the cost of repairing faulty stereos, appliances, power tools, and high-tech devices often exceeds the price of buying new. “Every time there is a big patch of warm water in the Pacific Ocean, you have a big drought and forest fires in the Amazon. That happened in 1982, 1997, 2006, and 2015. El Niño produced huge forest fires in the Brazilian state of Roraima and in Venezuela. How can i be happy , when 30 million women and girls are raped & beheaded , prostituted by religion and power. How can i be happy , that man controls the status quo . Pillages , plunders , taketh the whole . ‘Cause there aint nought here , to make ’em bow . So i look forward , to be nothing . Neptunes navy will rise again, but for now her soldiers are weary and the brass needs time to strategize. Watch the seas, she’ll be back.